I host Easter every year, and every year there seems to be some kind of a disaster. This year I faced a double whammy. First, I had a bad stomach bug early in the week, which shaved a couple of days off my preparation time. Second, and even worse, I couldn't find the recipes that have become my personal Easter favorites. 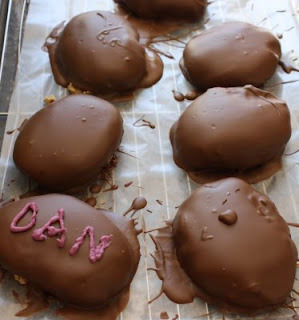 I'm kicking myself for never posting my Easter recipes on this blog. I'm convinced the stack of recipe cards is stashed in a cookbook somewhere. Those two mini-disasters meant that this year's Easter dinner just wasn't up to par. I'll eventually post the recipes I made, but they just weren't my favorite. The day did have one HUGE hit: homemade chocolate peanut butter eggs, a recipe from a cooking contest friend, Beth Royals. Beth and I were both in the Pillsbury Bake-off contest in 2004, but I really got to know her when she and I, as well as our sons, were in the AirBake Ultra Extreme Cookie Challenge together two years later. Her contest record eclipses mine, and since she gave the egg recipe rave reviews, I was confident it would be a hit. 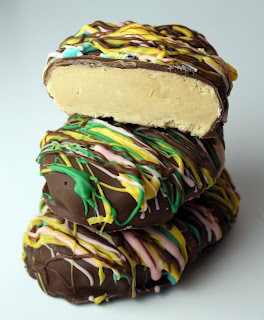 The peanut butter filling came together quickly, and it was easy to handle as my son and I shaped it into three- to four-inch eggs (which are huge as candy eggs go). I refrigerated them overnight to set. The dipping did not go as smoothly. I failed to notice that Beth had given specific instructions for dipping the eggs, and I just plunked them into the bowl of melted chocolate. Getting them into the chocolate was easy -- getting them out was another story. I used my usual candy dipping implement, a dinner fork, but the fork didn't support enough of the egg and the sides of the eggs chipped off into the melted chocolate. At this point a smart person may have checked the recipe to see if Beth had made any notes about dipping technique, but nooo, I have to figure these things out for myself. Next, I turned to a slotted spatula (of the pancake turner type). It worked better for getting the eggs out of the chocolate, and the chocolate dripped off nicely from between the slots, but then it was hard to get the eggs off the pancake turner! As you can see by the drips on the wax paper, it was a messy process. The next step was decorating the eggs. Beth puts names on hers and decorates them with flowers. That had been my original intention, as you can see by the name on the egg in the bottom corner, but I didn't like the way it looked. Instead, I drizzled them with various colors of melting wafers, interspersed with chocolate. I probably went overboard with the drizzling. I wrapped two plates for neighbors, and had planned to put one at each place on the table. At the last minute, though, I put them on a platter. When I served them, my sons and nephew just about pounced on them and grabbed one each. My sons managed to eat half of theirs, and wrapped up the rest to eat later. 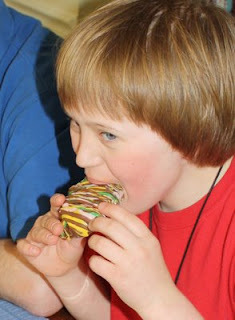 My nephew, however, downed just about the whole thing (his father took a few bites). "You could put Reese's out of business with those things," my brother-in-law said. I can't believe my nephew didn't have a bad stomach ache from eating that! My husband, mother-in-law and I divided one among us, because they slice neatly. The leftovers were sent home with my guests, and I kept a few. Even though my kids have plenty of Easter candy left in their baskets, they keep asking if they can have one of the peanut butter eggs. That's how good they are. We'll share the last one today. When I was struggling through dipping the eggs, I didn't expect I'd want to make these again, but they just may become an Easter tradition. Next time, though, I'd probably make them a bit smaller, to make them easier to dip and less gluttonous to eat. Combine about a third of the powdered sugar and butter in large bowl of electric mixer. Mix until well combined. Add peanut butter and marshmallow cream then gradually add remaining powdered sugar. Shape into eggs about 3-4 inches long trying to keep the bottom side flat. Refrigerate on waxed paper-lined cookie sheet to set (about 8 hours). Mmmmn! I wish I was your neighbor! Poor you, being sick AND losing your recipes. Years ago I lost my address book, which had in it the address and phone number of EVERY single person I'd ever known in my life. This was before computers could keep all that stuff handy. Months later, I found it in the pocket of my bathrobe. It was a miracle! I'm sure you'll find your recipes. When you do, not only put them on your blog, but save them as documents, bookmark your blog pages and print them out on 8 by 12 paper, which is harder to lose than a card. Oh yess!! These looks amazing. These are drop dead gorgeous. You're killing me! I liked the way you decorated them with the multi-colored drizzle. Buckeyes (peanut butter balls dipped in chocolate) are a Christmas candy at our house. Your filling sounds more delicious, though, with the marshmallow creme. YUM. And the decoration is really cute! This is something that would go over big at my house! I will have to remember these next year! You sound like me following a recipe! They still look really good!! I might try these next year. They look SO delicious - I cannot wait to try them! These look just like the reeses eggs, but better! I'm bookmarking for next year. Despite your troubles w/ the dipping, they turned out beautiful! Those look so good. too good. I would eat WAY too many. I made the little peanut butter cups and yes, the taste was was more amazing. I ate a Reeses after eating one of mine and they tasted so salty to me. Isnt that funny. I followed you here, from StephChows. I listened to some of your songs - I will have try and make it to some of the places you play at. And, I have to say, your son's band is amazing! That video of them playing at the Water Street Music Hall is amazing! What talent for their ages! After eating those I got sick. They were delicious but you can't eat a lot (like I did). My Grandmother gave me peanut butter eggs every Easter when I was growing up. I have been searching for a recipe so I can make them for my kids and carry on the tradition. 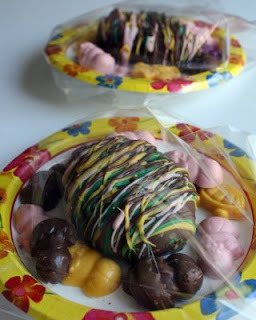 To make it extra special, I looked online and found a company, Box and Wrap that has the cutest Easter candy boxes and candy bags. I chose the bunny shaped candy box. Easy sugar cookies and Beagle sitting! Happy Earth Day (and a freebie)!